"There are more people, languages and cultures here than anywhere else on our planet. Africa is quite simply the most extraordinary, beautiful and luminous place on earth." Depending on your age, I'm guessing the name Bob Geldof either carries some personal weight, or at the very least means you've heard of him. Or perhaps the name means nothing at all. In my house, he's always been on the right side of rock cool, and that was well before he began a personal mission to save Africa. He's the rock star turned activist, the former lead singer for the post-punk band The Boomtown Rats, and who in the mid-1980s organized Band-Aid and the star-studded single Do They Know It's Christmas? to raise money to combat the deadly starvation in Ethiopia. For this six-part BBC television documentary series, Geldof returns to Africa 20 years later, leading viewers on a tightly focused look at the massive continent of 53 diverse countries. Each episode runs 30 minutes, and examines a particular region, painting a hot and dusty travelogue. But the travelogue elements are sandwiched between looks at the different people, most of whom somehow survive under extremely poor conditions while simultaneously living with the deadly instability of corrupt governments, violent warlords and rampant disease. According to the credits, the narration is all Geldof's own creation, and there is a stinging honesty to much of what he has to say, and I never had the sense he was reading someone else's words. 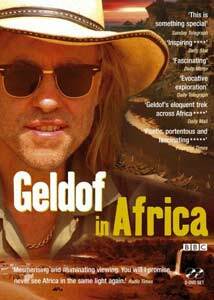 Geldof refers to Africa as "the luminous continent", a place filled with what he calls "a great emptiness", but it is also a diverse combination of deserts, rainforests, jungles, savannahs and coastal areas. This singular strangeness gets isolated during the loose thematics of each individual episode, with travels down the lush dangers of the Congo River getting equal time with the unbearable heat of the Rift Valley. The geographical diversity presented here is one thing, but it is the closeup stories of the people that transforms this from being just a run-of-the-mill travel doc. And all the of the stories are not always pleasant as you might imagine, though his return to Ethiopia shows the positive effects of humanitarian help in the last two decades. The most disturbing segment here shows up on The Four Horsemen episode�a part of which is a brutally frank depiction of how rebel warlords kidnap and murder Ugandan children�with a horrific recounting of the fate that befell a group of young girls. Geldof's been dubbed "St. Bob" by a lot of press, and sometimes it seems meant to be a jab rather than an accolade. I mentioned to someone that I had just watched this series, and I was met with a "I'll bet that wasn't too self-serving" comment (in part based on the title), and that's the kind of backlash Geldof's been getting for the past two decades because he has been so vocal�and to some preachy�on the subject. But if he weren't so seemingly sincere and compassionate I might agree with the "self-serving" dig, but maybe that's some of my leftover adoration of Geldof-as-rocker in me that wants to listen to what he has to say. If this were Mariah Carey or Garth Brooks in Africa, I might agree with it being a dose of star-trip self-agrandisement, but Geldof is appropriately angry and honest, with his involvement over the years seems nothing short of sincere and heartfelt. Self-serving or not, the images and stories presented here are often bleak and horrifying, woven in between panoramic landscapes and indigenous peoples that exist under a dark veil of unimaginable hardship. But this isn't all grim and depressing, and where possible Geldof and director John Maguire do find the beauty and humor, showing the rest of the world an Africa that most of never have seen. And that doesn't sound too self-serving to me. Right on, Bob. Image Transfer Review: All six episodes are presented in 1.78:1 anamorphic widescreen, and the image transfers offer solid amounts of detail and an abundance of bright, vivid colors. Even the night sequences, some of which were shot by vehicle headlight, look quite strong. No print debris or major compression issues (aside from some shimmer here and there) were evident. Audio Transfer Review: Audio is presented in 2.0 stereo, but it's a fairly full mix, one that provides a deep, resonant clarity to Geldof's voice. Similarly, the music sounds clean and robust throughout. Extras Review: This two-disc set comes housed in a colorful tri-fold case inside of side-cut slipcover, with identical images on both. Each disc carries three episodes, cut into eight chapters each, with optional English subtitles for the doc as well as the six episode commentaries (a feature I particularly like, though I can't really explain why). All six episodes have full-length commentaries from Geldof and director John Maguire, and as I mentioned are subtitled, as well. Maguire refers to wanting to capture "the other Africa," and discusses his original working structures vs Geldof's abstract concepts about what the series should be. And aside from a view dabs at dry humor (Geldof joking about having attend more masses during the shoot than he did in most of his adult life), the content generally delves deeper into background on some of the segments and people, making this almost like a second audio track rather than a commentary. Geldof speaks of filming under headlights during the open of the grim The Four Horsemen episode and talking to his significant other while she's at a lavish English party while he was nearly sobbing at the atrocities he was witnessing, and Maguire mentions that the dramatic intro was shot on the first take, warts and all. Disc 1 also has the optional Bob Geldof Introduction (02m:46s), a quick primer and thank you made just for the DVD. The Bob Geldof Interview (28m:33s) is divvied into three sections: How It All Began (07m:44s), African Season (04m:56s) and Reflecting On The Trip (15m:52s), or is viewable as one big piece. Framed in an awkwardly tight closeup, Geldof speaks of his initial "filter awareness" of Africa, which came through books like Tarzan, and speaks eloquently about the impact this most recent journey had on him. Over on Disc 2 there is a Behind the Scenes (06m:19s) segment split into three sections: Nana Kofi Kumasha I (02m:21s), Voodoo (02m:13s) and Djenne-Jenno (01m:45s). These are far less revelatory as the interview segment, and noticeably brief, but the background on Geldof's unexpected coronation as king in Nana Kofi Kumasha I is a nice addendum. A set of seven deleted scenes (11m:19s) are similarly short, but worth a look to catch a glimpse of the original boat Sir Henry Morton Stanley took on his legendary African journey for explorer David Livingstone in 1871, near Lake Tanganyika. Lastly, an automated photo gallery (05m:17s) wraps up the extras on Disc 2. Here's an intelligent and sympathetic six-part television documentary about the multiple personalities of Africa, with beauty, history and horror fused together in a vastly unusual patchwork. Bob Geldof seems genuinely sincere about his love for the continent and its people, and his anger and frustration offer a personal counterbalance to the typical neutral narration of most documentaries.